To accurately compare the best storage sheds you need to first look at your own unique situation. Your yard is unique. You have a certain amount of land, you may have trees, or fencing or you may be plotting out a future garden space. You may have a vast amount of space, or you may only have a small plot of land in the city. Whatever physical yard space you’re working with there is a storage solution that will match. You also need to consider your unique need for a shed. You may say, “I just need room for my stuff,” but your “stuff” looks different from the next guy down the road. You may need room to store Christmas decorations or you may need room to store your extensive train collection, or you may need room for all of your hunting gear in addition to your ATV. Doesn’t matter, it’s still all things you want to keep safe. As you search for the right shed that fits your yard and your specific storage needs, make sure you do a full comparison. Look not only at different brands, but also examine the different shed styles fully to find the match that will work for you. 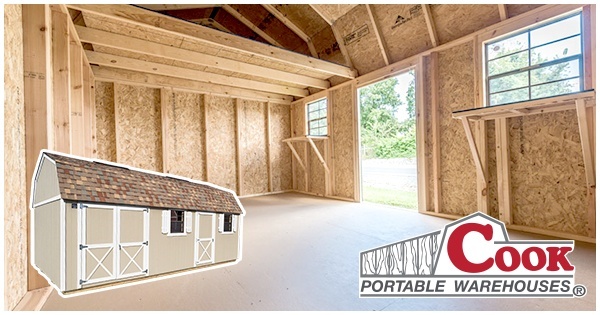 What should you be asking as you compare the thousands of portable building options out there? Let’s start with a few questions to ask your shed dealer. What are the sheds made of? How does this compare to what your competitors use? Do you have any warranties or price guarantees on these sheds? When the shed is delivered, who will deliver it? Who do you call if there is an issue or we have a warranty claim? How long has your company been in business? What’s their story? We are happy to answer all of these here or in person at one of our local dealer locations. For an easy comparison, read our Dare to Compare Checklist. It’s a great resource for knowing the types of questions to ask and also to see how Cook measures up to other options you could choose from. If you’re wanting a versatile storage option, this is the shed style to choose. With its tall sidewalls and the option to add a loft, you can have control over what your shed becomes. If you want something to add style to your backyard, you might add a window, flower box and shutters. This way your shed looks appealing from the outside, even if you’ve got a mess of boxes on the inside. Utility sheds can become man caves, she sheds, a workshop and more. Or you can simply use it as a storage space for lawn equipment and gardening tools. Take a tour of the Utility shed! If you’re really wanting two sheds...then the Handyman is the right choice! It’s 2 sheds in 1! You will enjoy having space specifically for storage and then a separate space to be used as a workshop, large equipment storage and more. The handyman has two rooms, one with a pegboard wall and the other with a loft built in. Plus, there are two windows with a small workbench built underneath each. If you have a very large backyard or a farm, the Handyman is a great solution for your storage needs. Take a tour of a Handyman Shed today! Andrew L. -- “Got mine a few weeks back and just love it, I would recommend to anyone." 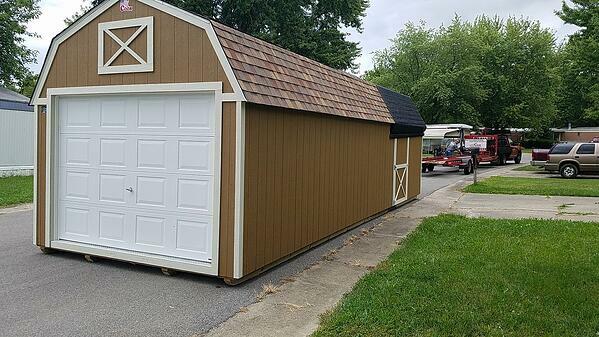 Do you want a garage for your car or lawn equipment but also need space for storage? Do you find your attached garage is always too full to use? The Cook Lofted Garage is the perfect combination of storage and garage space. This shed comes equipped with a heavy duty floor system with ¾” floor decking and floor joist 12” on center. Our floor system in the Lofted Garage option has a weight limit of 65 lbs per sq. ft. Whether you’re wanting to store your car, a small tractor or an ATV, this is the option you’ll want to choose. Take a tour of the Lofted Garage! Cook now has a shed style for those living in an HOA community or a smaller neighborhood in the city. Even if you have a gated backyard, it is possible to get the storage space you need! If you’re just needing a small space for garden tools, holiday decorations and overflow from the house, the Slim Shed is an excellent choice. 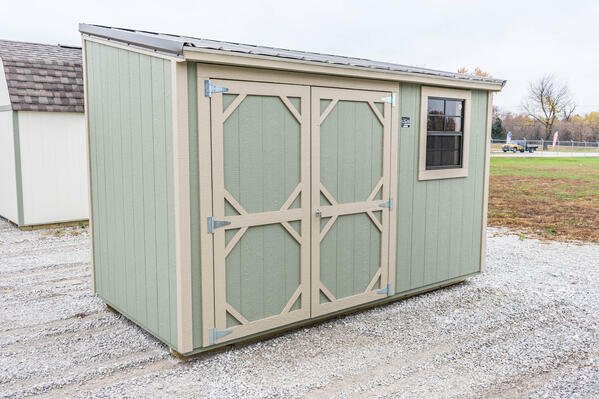 As long as your gate is 8 ft. wide and you have 14 ft. of vertical clearance, we can deliver your shed with just a small down payment under our rent to own program. You will find that this quickly becomes an extension to your home. Take a tour of the Slim Shed! 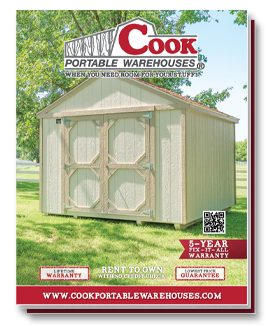 Cook portable sheds are a great option for anyone looking for room for their stuff, no matter what it is. If you’re ready to build your shed, find your local dealer or start building your shed online today!